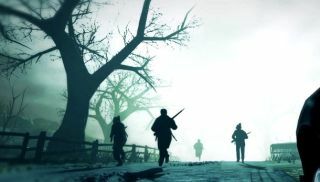 Zombies seem like an odd choice for Sniper Elite V2 expandalone Nazi Zombie Army. There are lots of them, ceaselessly shuffling towards the smell of a brain currently preoccupied with wind-adjustment calculations. A far cry from the cold, clinical, sadistic professionalism of a top marksman. It seems Rebellion agree, because this first game footage is extremely light on, you know, actual sniping . Instead, Karl Fairburne - long distance hero and massive goddamn jerk - breaks out shotguns, machine guns and explosions to tackle the approaching hordes. When he does shoulder his sniper rifle, we see the return of the slow-mo kill-cam as a zomb gets popped in the kidney. Fairburne, you idiot! That is not how you take down the undead! Sniper Elite: Nazi Zombie Army is released later today, and also brings 4-player co-op to its new campaign.